"Scammell Rigid 8 - Reg No FJH 102 was brand new to Albright & Wilson of Widnes in October 1939 for a discounted price of £1,600 which is the equivalent of an unbelievable £88,435 by today's value using the Historic Inflation Calculator. The price included the body and finished painting. In 1952 it was subsequently sold to Round Oak Motor Services of Stourbridge and was then used extensively on the movement of tinplate between South Wales - the Midlands and Scotland. In 1956 it was sold on again this time to Mountford Brothers of Bucknall Stoke on Trent were it was used on general haulage between the potteries and Liverpool. Around this time, after approximately 16 years of service, it had a new cab built and fitted by a company called E,Wigglesworth & Co (Stanningly) Ltd. The actual cab that is on the vehicle today of course has been completely rebuilt after extensive restoration. 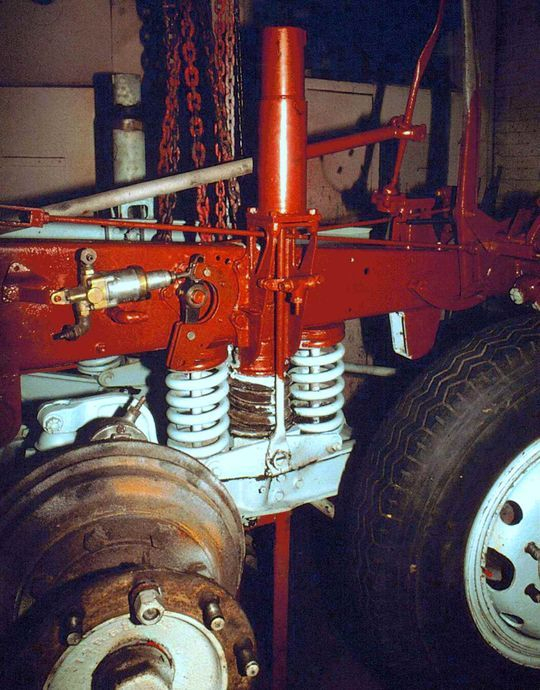 After the rebuild it was used In conjunction with a four-in-line dolly extensively for the countrywide movement of 40 to 60 foot steel girders and fabrications from the Shelton Iron and Steel Co. 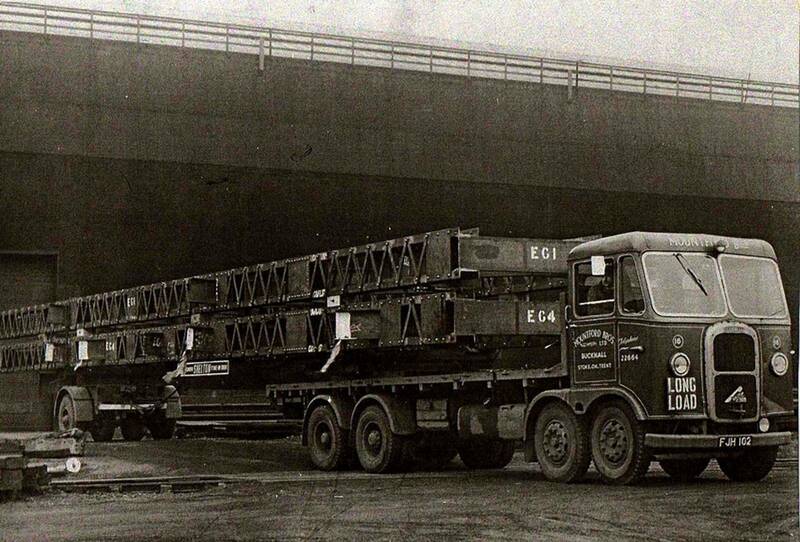 It actually carried the girders used in the construction of the then new Rover Company plant at Solihull with some of these loads being 70 foot long and above the vehicles 32 tons gvw. 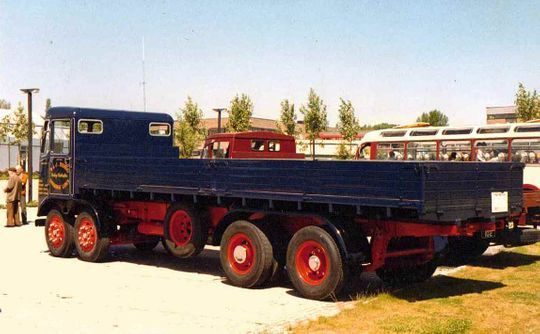 In 1967, after 27 years service, it was finally replaced by a Leyland Octopus with a tilt cab but as the Scammell had been such a good machine for many years at Mountfords it was then parked up in a corner of their yard and allowed to die with dignity. Fifteen years later in 1982 i purchased the dilapidated vehicle at a sale when Mountfords closed down and then began the long task of restoring it to its former glory. It was rebuilt to a very high standard in our own Longridge workshops and emerged three years later in 1985 to take part in the Tyne -Tees Rally and has appeared at various rallies all over the country ever since. In July 2005, after covering many miles on the rally circuit, disaster struck the old girl when she knocked out No 5 big end on the way down to a rally near Shrewsbury due to oil starvation caused by a piece of silicone jointing compound coming loose and blocking the oil way. Subsequently the Gardner 6LW engine was removed and sent to Paul Gardner Engineering where it was re-manufactured to perfection and at the same time the opportunity was taken to re-bush the main front bogie suspension kingpost. All this work resulted in the vehicle being off the road for a period of 12 months but it duly emerged in 2006 to begin it's rally career again. As a foot note this was the very last engine to be rebuilt by Gardner's and thus has a very special place in the history of that famous company". 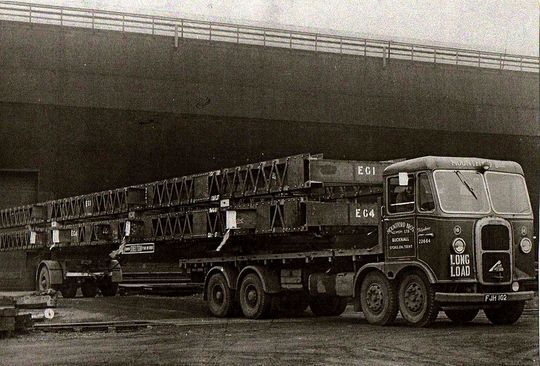 Scammell Rigid 8 Reg No FJH 102 is seen here in the late 1950's when in use by Mountford Bros with a load of steel beams which must be approaching 100 foot in length. 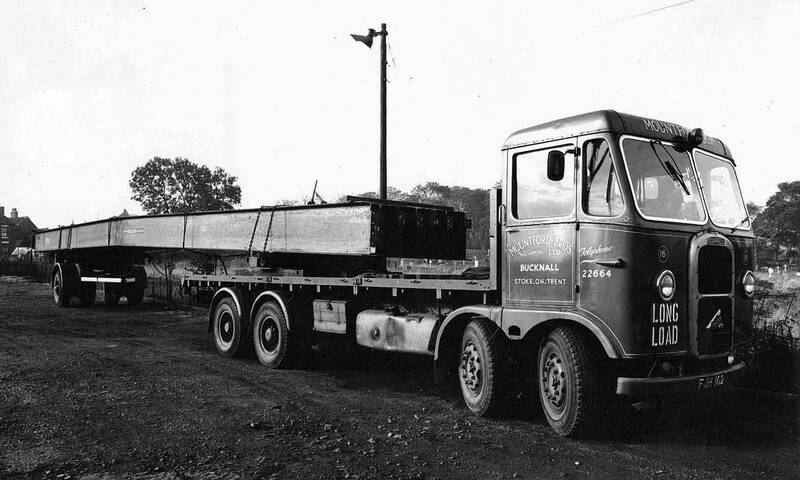 Another long load of manufactured steel taken in the late 1950's when the vehicle was owned by Mountford Brothers. 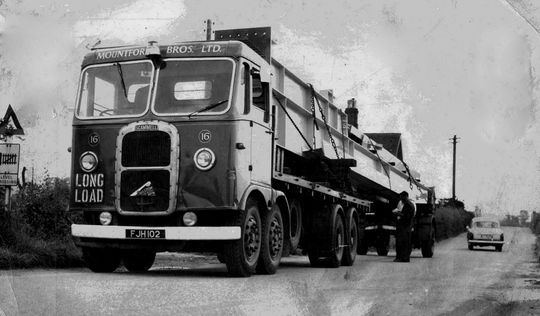 Mountford Brothers certainly put the vehicle to good use over the years that they owned it. Seen here at Shelton Bar steel works in Stoke-on Trent the huge site in its heyday covered around 400 acres, employed 10,000 in the steelworks, had five coal mines, a complete railway system, and a by-products processing factory. 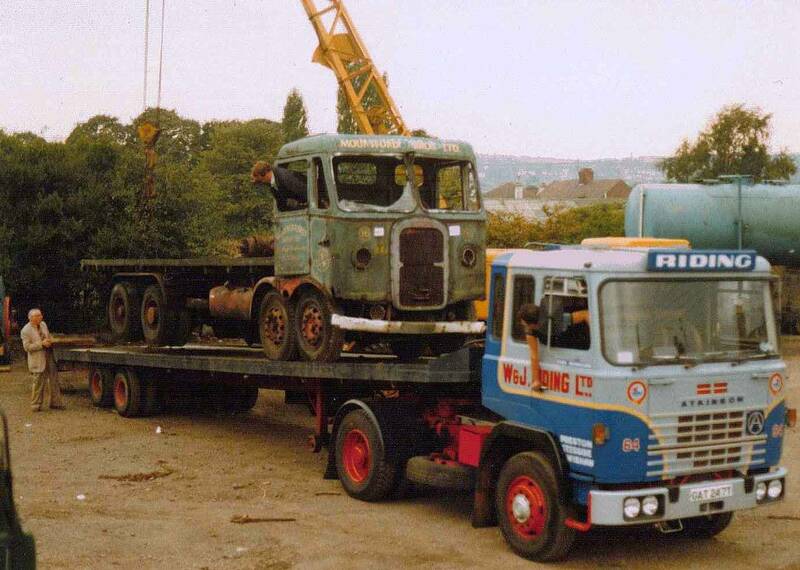 1982 and Seddon Atkinson 400 Series 4x2 tractor unit Reg No GAT 247T 'Earl Marischal' was used for the job when Tom Riding and Stuart Ainsworth went down to Stoke on Trent to collect the derelict Scammell which Tom had bought for restoration. Mr Mountford is shown at the rear of the vehicle lending a helping hand to load it up. It had been such a good vehicle for him that he was reluctant to see it go when it had finished work so for 16 years stored it in the yard and stood fuel tanks on its back. 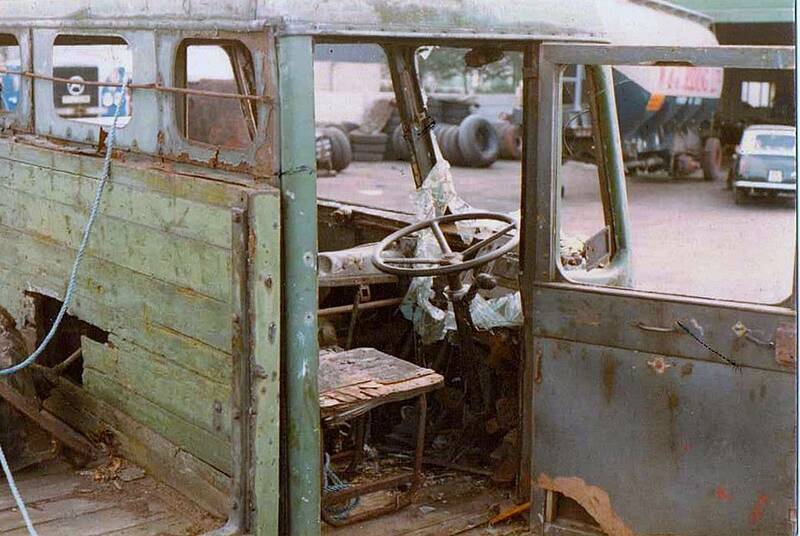 This photograph shows state of the vehicle's cab after Tom Riding got it back to Longridge before the start of three long years restoration work in Riding's workshops. 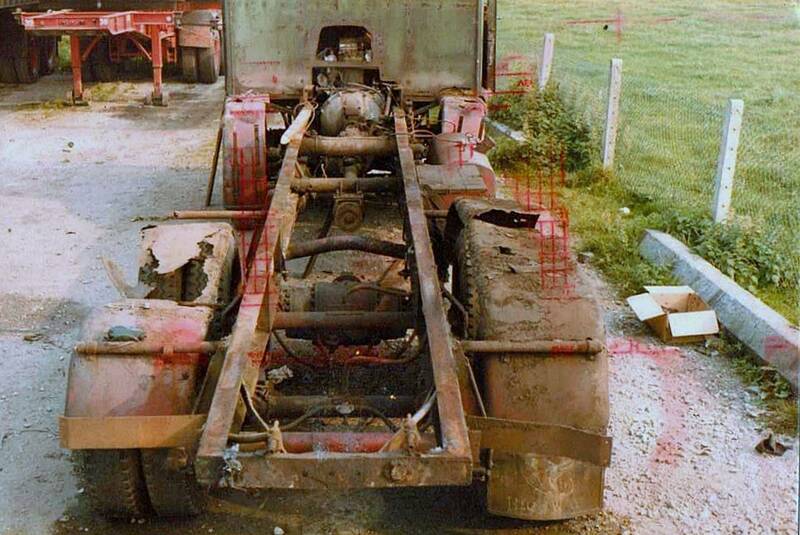 Another pre-restoration shot taken in 1982 shows the sorry state the chassis was in after Tom Riding got it back to Longridge. Compare this with the picture below taken 12 months later. Twelve months on from the previous picture and after many hours work the restoration of the Scammell Rigid 8 at Longridge is well and truly underway. 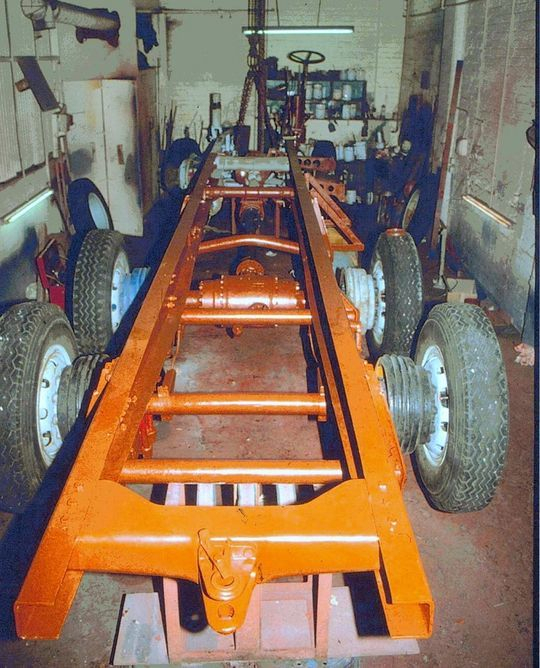 A close up view of part of the chassis taken in 1983 after it had undergone many man hours of restoration work of the highest standard in W & J Riding's workshop at Longridge. 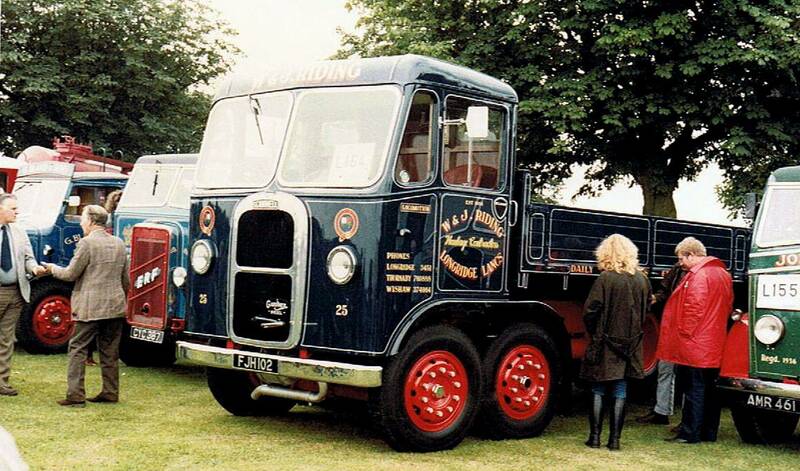 After three years hard work the restoration of the Scammell Rigid 8 was finally completed in 1985. The goal which had been set was to have it ready for that years Tyne -Tees Rally. Seen here fresh out of the paint shop and ready for the road the picture above was taken outside Longridge depot just before the off on the weekend of the rally in 1985. 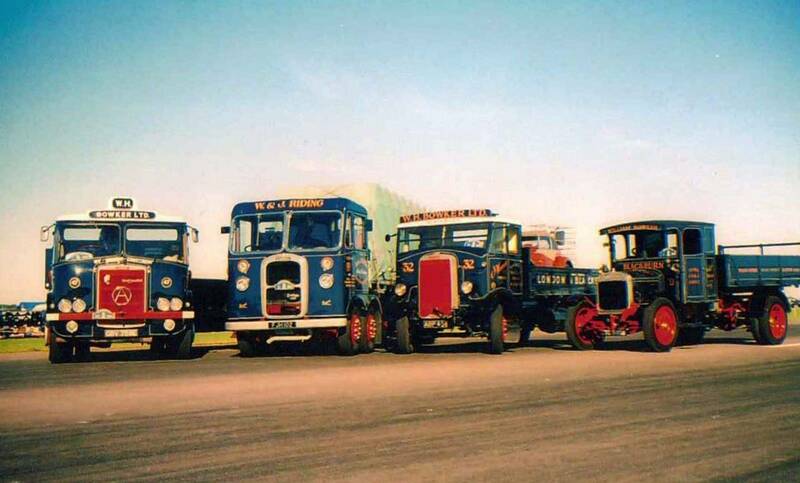 Seen here at the 1985 Tyne Tees Rally Scammell Rigid 8 is pictured taking a mid rally break at Chester-Le-Street. 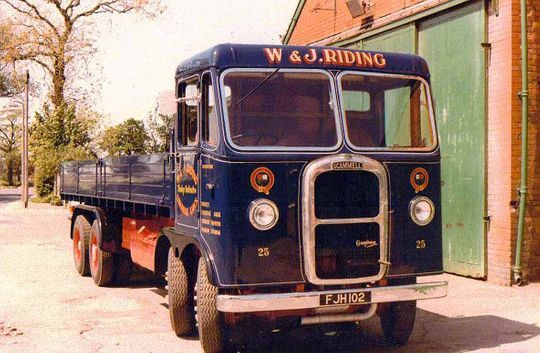 The old gentleman wearing the flat cap stood in front of the vehicle is the late Mr Jim Riding, founder of the company. 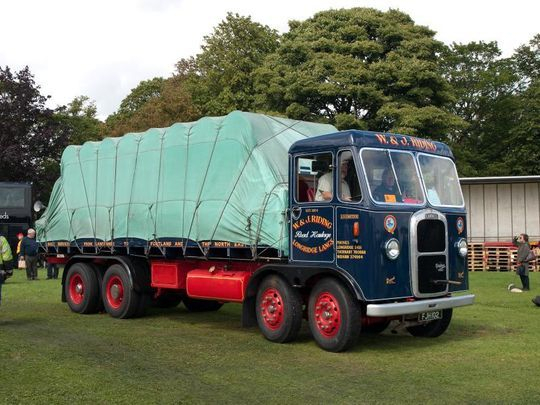 At 85 years old, he had taken the time out to go on the rally along with his son Tom and was quite proud of his efforts in restoring the Scammell to its former glory. Seen here on it's second outing in 1985 Scammell Rigid 8 Reg No FJH 102 'Locomotion' is pictured on the Stray at Harrogate at the end of its first Trans Pennine Rally. Tom Riding can be seen on the far left of the picture having a chat with Andrew Warring. 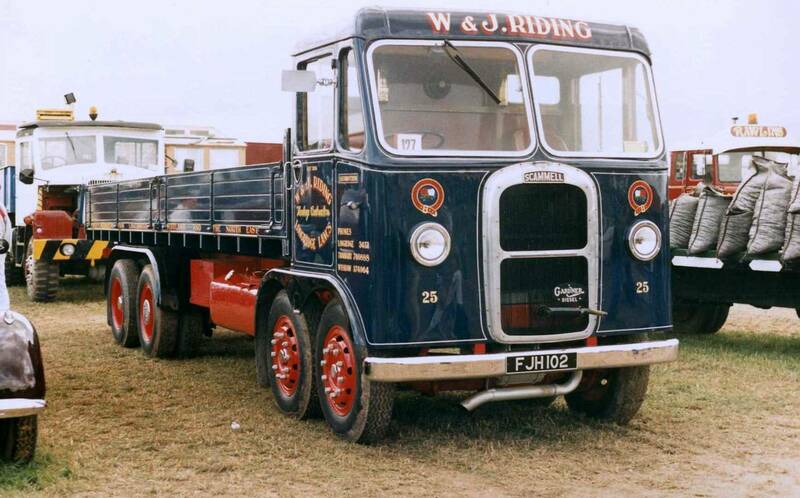 Scammell Rigid 8 Reg No FJH 102 'Locomotion' is seen here attending another rally in 1985 not long after a three year restoration programme which saw Tom Riding restore the vehicle to all of it's former glory. 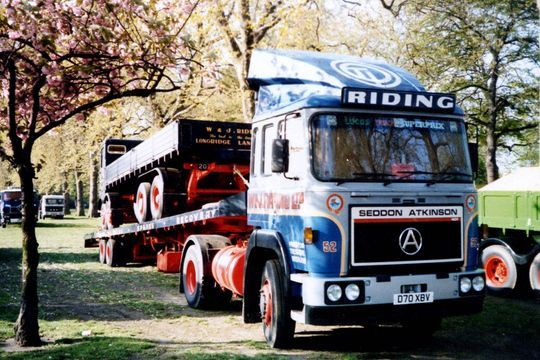 Seddon Atkinson 401 tractor unit Reg No D70 XBV is seen here in Battersea Park London in 1988 acting as tender vehicle for Tom Riding's Scammell Rigid 8 - FJH 102, 'Locomotion'. This picture was taken the evening before Tom drove it in the London to Brighton Historic Commercial Vehicle run. May 1988 and Tom Riding is seen here at the wheel of his Scammell Rigid 8 as he heads down to Brighton for the annual rally. Toms good friend John Dickson Simpson, who was enjoying the ride down, took the photo unbeknown to Tom. Home comforts were in short supply with the Gardner 6LW blowing your brains out. One of Tom Riding's favourite pictures of his Scammell. "Seen here in the rain just before dusk we were heading home from the Trans Pennine rally, which had finished at Harrogate, travelling down my favourite road the A59. I was driving with my late brother James in the the passenger seat and Cumberland John sat on the bonnet. 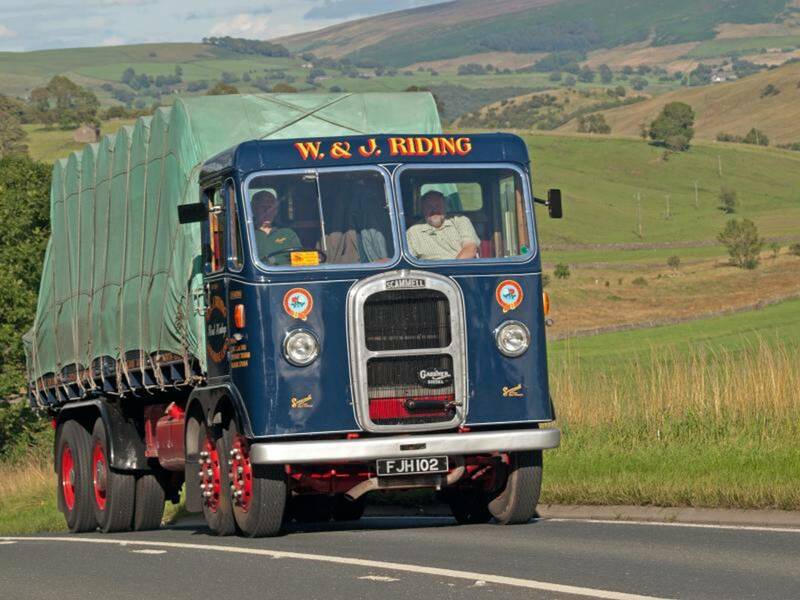 The photograph was taken by Alan Dixon who drove for us for many years and has rallied the old girl ever since i restored it. As a joiner by trade, he rebuilt the cab when the timbers started to rot and he also replaced the floor when i refitted the engine in 2006, happy days". In 2005 disaster struck the Gardner 6LW engine when it knocked out No 5 big end on the way down to a rally near Shrewsbury in Shropshire. The cab was taken off and the engine removed and sent to Paul Gardner Engineering for a complete rebuild to as new standard. 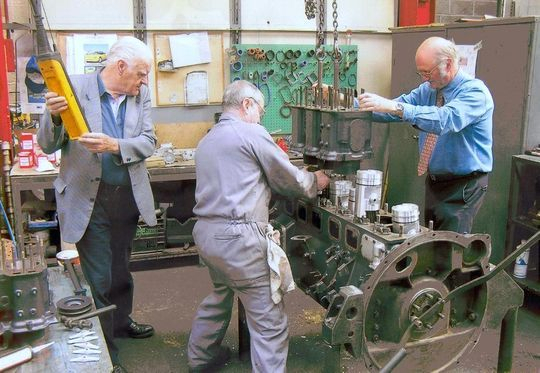 The picture above shows the engine in the process of rebuilding with Tom Riding operating the block and tackle while Mr Paul Gardner (right) is locating the front cylinder block. 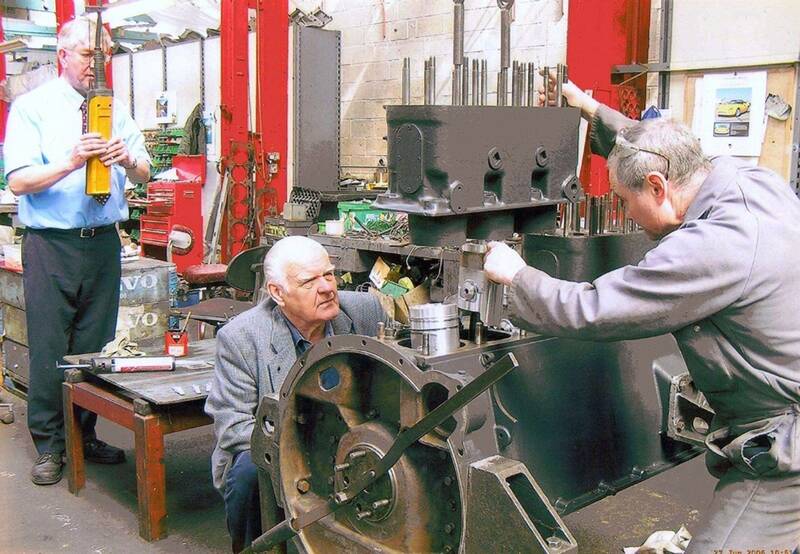 Tom Riding is seen here taking a close interest whilst the rear block is positioned during the rebuilding of the Gardner 6LW engine. "The man operating the overhead crane is Mr Eddie Rayner who spent his whole career as an engineer with the various Gardner companies and he was very helpful to our company over many years. The fitter on the right who is building the engine is Mr John Ashton. 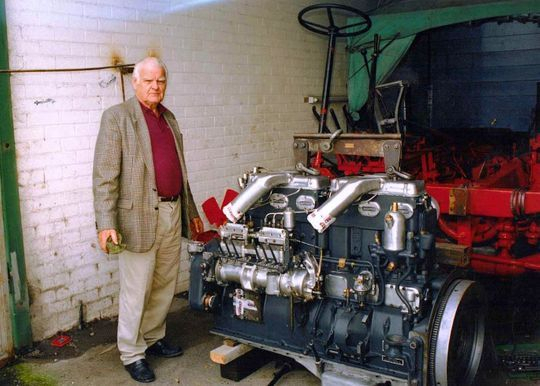 In 1970, when working for Pelican Engineering of Leeds, he had rebuilt a badly damaged 6LXB engine for me and 35 years later i was delighted whilst working for Paul Gardner Ltd he was given the job of rebuilding my 6LW how's that for continuity?" Tom Riding pictured with the newly rebuilt Gardner 6LW engine back at Longridge shortly before installation. The engine still needed dressing ie the air compressor needed fitting as did the flywheel and clutch housing. 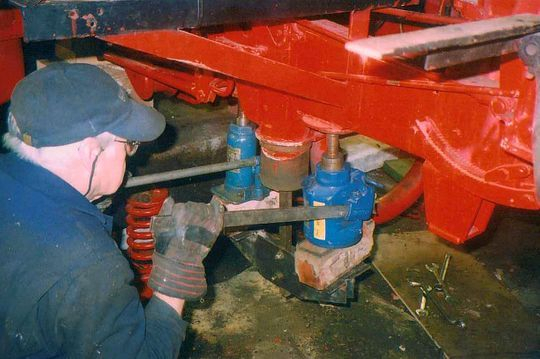 While the engine was removed Tom Riding decided to rebush the front bogie brackets and is pictured here while struggling to jack out the main bush. Tom had to design and make the puller but as you can see even with the use of two Lake end Elliot jacks that the bushes didn't want to come out. With the Gardner 6LW engine totally rebuilt it was full steam ahead as Scammell Rigid 8 Reg No FJH 102 'Locomotion' heads towards Harrogate during the annual Trans Pennine Rally. Note the nice dummy load of reels of paper on the back which actually doubles as living accommodation. Scammell Rigid 8 Reg No FJH 102 'Locomotion' arrives at the Stray in Harrogate after completing the 2011 Trans Pennine Rally which started at the M62 Birch Services near Manchester. Photograph courtesy of Mike Richardson. With owner Tom Riding at the wheel Scammell Rigid 8 Reg No FJH 102 'Locomotion' heads home to Longridge via the A59 near Skipton in North Yorkshire after appearing at the 2011 Trans Pennine Vehicle Rally. 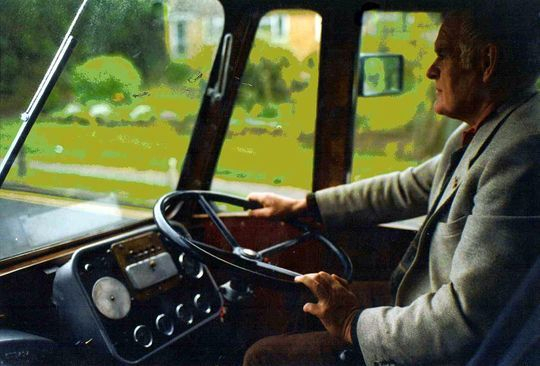 Tom Riding recalls the time he sent his Scammell over the water to Sweden. 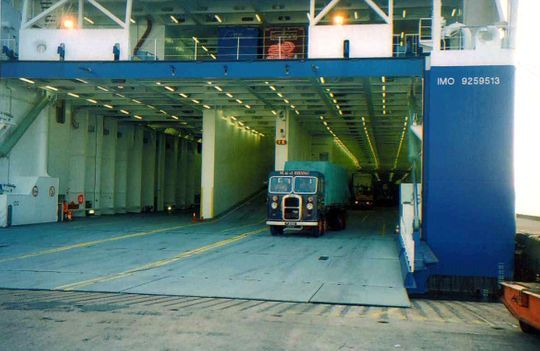 "In 2004, whilst i was doing some shopping in Sainsbury's on Greenwich Peninsular, i received a phone call from the late Geoff Whittle who at the time was the fleet engineer for W.H. Bowker of Blackburn. He asked me if i would be prepared to let my Scammell go to the Pärlrallyt in Helsingborg Sweden which was sponsored by Volvo. At the time i thought it didn't seem a bad idea so i arranged my friend Alan Dixon to take it across in August 2004". 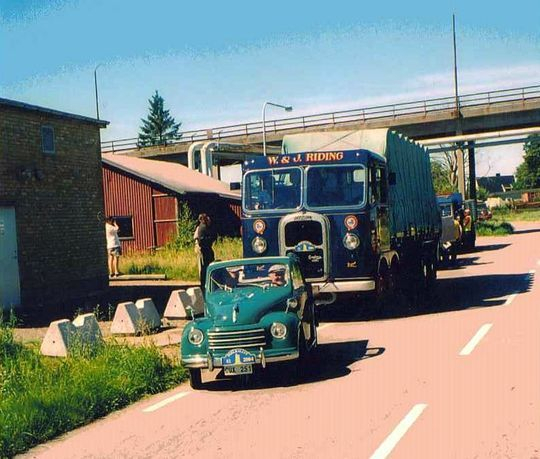 Tom Riding's Scammell Rigid 8, driven by Alan Dixon, is pictured here on the 13th of August 2004 coming off the ferry at 6.30 am after the overnight crossing to Gothenburg Sweden. After a visit to the Volvo factory Alan Dixon drove the Scammell down to Helsingborg and took this picture during a break in the road run. 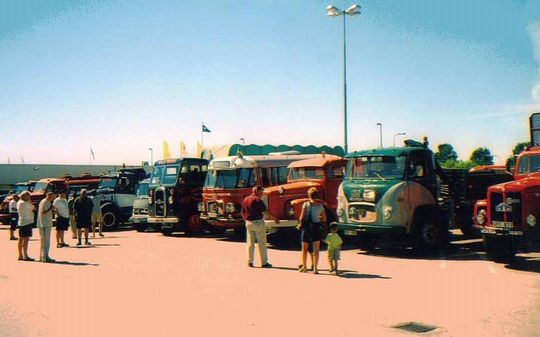 After the road run this was the line up of what was a large gathering of vehicles at Helsingborg. In this final picture, taken in Sweden in 2004, Tom Riding's Scammell is seen here with the three vintage lorries that W. H. Bowker owned and sent on the rally. 1967 Atkinson Mk 1 unit fitted with the legendary Gardner 180 engine. 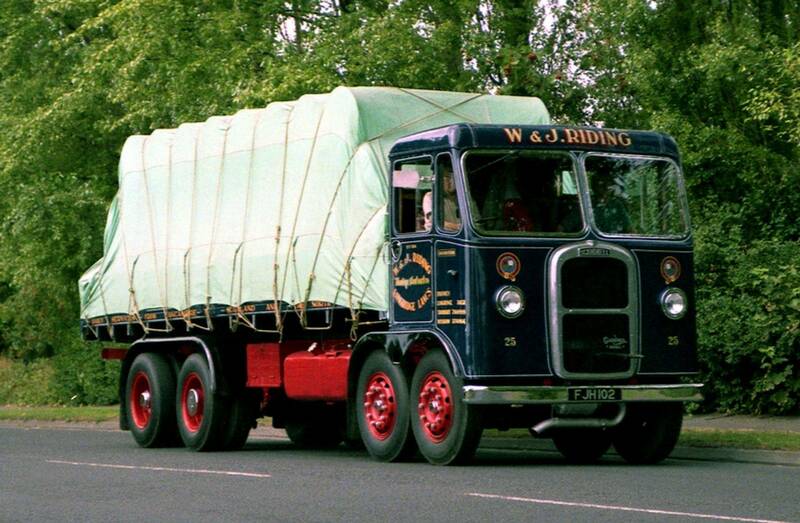 1939 Scammell Rigid 8 fitted with a Gardner 6LW engine. # 1937 Leyland TSC 9 Beaver fitted with the Leyland 8.6 litre engine. # Some years later this 1937 Leyland TSC 9 Beaver was completely destroyed in the disastrous warehouse fire at W. H. Bowkers depot in Bamber Bridge. A 1920s Thorneycroft fitted with manually operated tipping gear. Photographs courtesy of Alan Dixon.